Technically, a trademark does not have to be registered with the federal government to exist, although there are benefits to registration. An unregistered trademark that contains a word, phrase, slogan or product name is identified by the letters TM or SM immediately following it, usually in superscript. 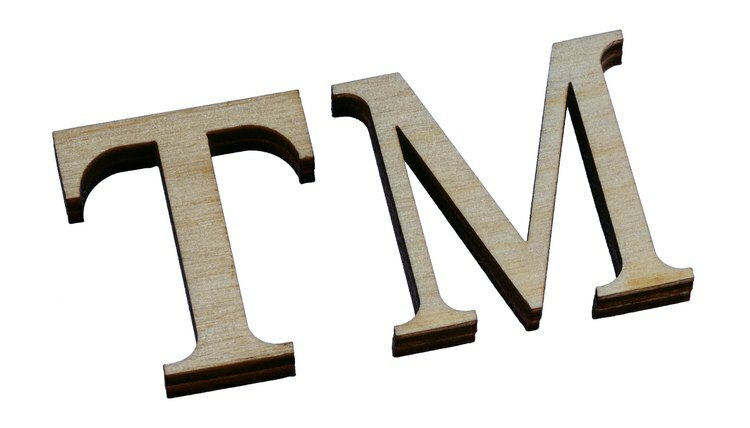 The TM designation means a mark that applies to goods, while the letters SM stand for "service mark," to indicate a trade or service used in commerce. If the trademark is registered, the letter R appears in a circle. The most distinctive trademarks identify the source of goods or services by association or suggestion, as opposed those that describe a product or make a generic reference to it. For example, “Apple” is a successful trademark because it refers to a brand of computer, but it wouldn’t cut it as a brand name for the fruit of the same name. Even in the absence of TM and the registered trademark symbols, it’s still fairly simple to identify a trademark by its presentation. Unique spellings and capitalizations point to a trademark, as in “Brite-Lite” and “LITE-BRITE”; the former represents a distributor of electronics, and the latter represents a child’s toy. The standard practice is to treat the mark as an adjective, not a verb or noun, a lesson taught to the Otis Elevator Company in the landmark case, Haughton Elevator Co. v. Seeberger. In 1900, an employee of the company named Charles Seeberger secured U. S. trademark No. 34,724 for the word “Escalator,” the brand name given to his newly invented moving stairway. Unfortunately, because the company often used the word in advertisements to refer to "an Escalator," as opposed to an "Escalator brand moving stairway," the word became associated with the actual device rather than its source, the manufacturer. As a result, the company lost all rights to the trademark in 1950 and the word remains in the public domain today. A trademark is a symbol, design, word, phrase or combination of these elements a business uses to identify its products to the public. While a trademark is active, its owner can take action in court against unauthorized use of the mark. A dead trademark, however, is no longer protected against unauthorized use. A mark can die for various reasons, including lack of use and misuse by an assignee. When Does a Trademark Become a Generic Term? Trademarks are licenses that businesses obtain to gain the exclusive use of a word or term for their business. This is to allow these organizations to better market their specific products or services by attaching their brand to a recognizable term. If anyone else uses the term, the business that holds the trademark can sue for damages and get the other business to stop using it. However, some terms may be classified as general and cannot be trademarked. It is important to understand what qualifies as a generic term and whether a term can be something that can be trademarked but transformed into a general term.